The rehab programs have a one-time payment only, no further subscription fees and no ongoing costs. They range from $69 for the 8 week mobility and stretching programs, $99 for the 12 week rehab strengthening programs and $149 for the extensive 24 week injury and surgical rehab Programs. All programs are inclusive of GST and are in Australian dollars. Payment is by way of VISA, Mastercard or AMEX card once you have registered a user account. How do the subscription options work? How does the add a program discount and multi-packs work? What content can I view for free? 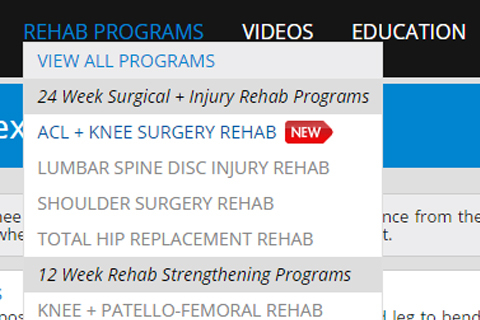 You can view any rehab program week, exercise, instruction video, education video or seminar that has a "FREE" symbol in the top left corner. To search for specific free content go to the Discover + Search Free Content page and either search by category or do a free search using key words to search the site. You will not be able to view "+" content unless you purchase a particular program. Can I see what programs look like before I buy? Yes. Every rehab program has FREE PREVIEW WEEKS where you can go into a particular week in the program to see how the programs are structured and what to expect in each week of the program when you purchase. This gives you piece of mind of the quality and detail of the program, and what to expect in terms of the content, exercise selection and depth of the program. In each preview week you will be able to access all videos and exercises that have a FREE symbol on them. Why can't I view some videos with a "+" symbol? The plus symbol shows which content is only available once a program or subscription is purchased. You will see a mixture of free and plus symbols throughout the exercise and video library sections and in the preview sections of the programs. When searching free content in the discover section you may find other exercises and videos that are secured with the plus symbol. You can see the free exercise and videos when you are not signed in, but not the purchased content until you either purchase a program, a subscription or sign in (if you have already purchased). How long do I get access to the content? Once you have purchased a program you will get access to that content for a period of 12 months from the purchase date. During this time you will be able to access all content that is part of the purchase as well as every secured exercise and video in the libraries. After the initial 12 months your access will expire but before this you will be notified by email of the expiry of your purchase and be able to re-purchase the same or other content as a discounted rate. With subscription options, you will get access to the exercise and video libraries only (not program content) for the period of access you have subscribed to (e.g. 1, 6 or 12 months). Subscriptions are recurring so you will have continual ongoing access if you do not cancel your subscription. What do week rules and pre-requisites mean? These rules are in place to make sure you follow the program correctly and at the right timing for optimal recovery. The weeks have been set as a guideline, however some people may be slower in their rehabilitation due to many factors and in some cases you may stay on a set week for two or three weeks instead of one, as you are not expected to always complete a 'week' in 7 days. It is also not advised to push yourself or progress before you are capable and you are not allowed to move onto the next week until you have completed the prescribed volume of exercises in that week. That is why there are pre-requisites to guide you through each stage and keep you on track. At the beginning of each stage you will be required to pass the pre-requisites in order to continue onto the next stage. These goals and guidelines are set and designed to help make sure you don't progress into a more difficult stage or series of exercises until you have certain range of movement requirements, can perform prior exercises correctly, adequately and enough volume as well as setting a benchmark for progression and goals. It helps ensure that all the exercises are completed without 'skipping' a workout or certain key exercises. It also aids in the prevention of pain as well as re-injury and gives you a correct level and speed of rehabilitation during each stage. Do I have to see a Physio as well? The programs in this site are not designed to be a replacement of seeing a Physio. In fact, we strongly endorse the use of the Physio and hands-on treatment through the course of your program, especially the extended surgical and injury rehabilitation programs. At the start of each stage it is highly recommended to 'Check-in' by making an appointment with your local Physio to get re-assessment and for them to monitor the progress of your rehabilitation as well as help you perfect and correct the exercises that you are doing in the program. This will help you keep on track and get the maximum benefit and results out of the rehab program and the best possible outcome. To save this site on your device as an app icon for easy access, simply tap the 'share' icon in your browser and then select 'add to home screen'. This will create a icon of the site onto your home screen ready for easy access whenever to need it. Go the the main menu under Programs and then "VIEW ALL PROGRAMS" to see what is current released and what is coming soon. You can then get a taste test of the new rehab programs by viewing the "PREVIEW WEEKS". Each program has preview week(s) for you to check out the layout and type of content in the programs. Simply click on the preview button on the specific program page to go to that section. You can also SEARCH FOR PROGRAMS and view the free weeks in search and discover section of the website. There FOUR type of videos that you will see when you are searching for content and inside the rehab programs. The exercise instruction videos are a muted videos that run for 20-30secs and loops to show you visually exactly how to do the exercise. Most exercises in the site have these videos. The weekly videos are inside the rehab programs and show real patient's progress in the same stage of the injury in that week, detailing how they are doing the exercises and their rehab progress. There are great inspirational and motivation videos to help you move through week to week. The plus symbol shows which content is only available once a program or subscription is purchased. You won't be able to view this content until you either purchase a program, sign up to one of the subscription options or sign in (if you have already purchased). When searching free content in the discover section you may find exercises and videos that are secured with the plus symbol. If you have purchased a program or subscription you will be able to view all exercises and videos across the site that have the plus symbol. To view a specific program week however, you will need to have purchased that entire specific program. 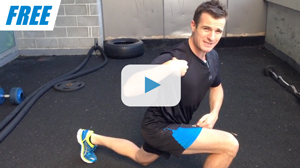 When you see a rehab or mobility exercise in the exercise library that is watermarked, this also means it is only available once a program or subscription is purchased. The blue watermark will disappear once you have logged in (if you have already purchased). When a video icon is in the top right of the exercise, it means there is an INSTRUCTION VIDEO to view for this exercise when you click/tap on the exercise image. Most exercises that can be progressed (or regressed) have "Progression Levels". This is where you can see how each particular exercise or stretch can be made more difficult or less difficult, by altering the exercise slightly with added resistance (such as bands), adding weight, making the surface more unstable (using a BOSU) or simply doing it with one arm or one leg. It is strongly advised that you don't attempt any progression of an exercise if you are not capable of doing the current level, and if you find the current level too difficult you can choose the level below. To purchase a program and view the content with a PLUS symbol, you will first need to create a USER ACCOUNT. Go to the Login menu tab and click MY ACCOUNT to enter in your details. You will need to enter in a valid email address and this will be you unique user name. Once you are logged in you can access MY LIBRARY where you can purchase programs and then they will be stored in the library section for easy access, as well as options to purchase other available programs. 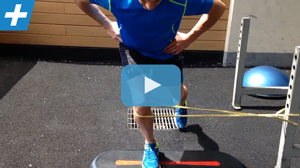 To view a rehab or mobility program you to need to purchase the specific program. To view the exclusive exercise and video library content you need to sign up to one of the available subscriptions, OR purchase a program. Both purchase options give you full access to both the Exercise Library and the Video Library, over 400 detailed and progressive mobility and rehab exercises, which include over 400 instruction videos and 150 rehab and mobility education videos. All program purchases give you entire Exercise and Video Library access for 12 months, so you don't need to subscribe to the exercise and video libraries if you currently have access to a purchased program.